a. You want to understand how mutual funds really work so you don’t make a bonehead mistake. b. It’s important that you avoid stinky funds and identify good candidates from which to select your investments so your money works and secures your retirement. c. You don’t know where to start looking for the best funds and you want to make sure to maximize all those years of compounded growth ahead so you don’t have to worry about your future. By the time you finish studying this guide you’ll know which funds to consider (and which to never consider), how to identify the strongest candidates for your portfolio and where to look for them. Once you master this, you’ll be ready for the next guide which explains how to build your investment portfolio. So again, let me be clear. First, we’re going to understand how funds work (hint: it’s very different than most people think), learn where to look for funds and then discover how to select the right funds to add to your potential investment universe. Also, please understand that while this guide speaks about mutual funds, you can (and should) use the same process to identify ETF’s and index funds to add to your universe. The next guide will tell you how to select the best investment strategy and consequently pick the best funds within your universe of great funds, when to buy them and when to sell. This is exciting stuff if I do say so myself. What is a mutual fund? You might think you understand how mutual funds work but my experience tells me that people buy them without really understanding what they are. The problem with doing this is that it can lead to some painful & expensive disappointments. Lets make sure you don’t get caught in that trap by taking apart this topic piece by piece. A mutual fund is simply an investment pool. You invest $10,000. I invest $1,000. Your rich uncle invests $100,000. All the money goes into one big pot that is called a mutual fund. The manager of the mutual fund decides what stocks or bonds to buy and sell. The manager can’t do whatever they feel like doing. They must adhere to the criteria set forth by the mutual fund prospectus which details which investments are fair game and which are forbidden. As long as she stays within those boundaries, she can do just about whatever she likes. Are your mutual funds safe? Every investment has risk. In a different guide, we looked at the risk of inflation and how keeping money growing at very low rates over long periods of time is actually quite risky. Now lets consider the risk to your capital as it relates to growth mutual funds. First, keep in mind that “safety” means different things to different people. When it comes to mutual funds, there are 3 or 4 ways to define safety. Let’s go through them one by one. 1. Is Your Mutual Fund Insured? Nope. Your mutual fund isn’t FDIC insured or by anyone else. Your principal fluctuates in value. That means you might end up with less money than you started with. If that happens, it’s a bad vibe but it is part of the game. Expect fluctuations. 2. Is Your Brokerage Account Insured? Usually, the answer is yes. Most brokerage accounts have SIPC insurance (Securities Investor Protection Corporation). This insurance covers you for up to $500,000 (including $100,000 or $250,000 in your cash accounts depending on your custodian). This coverage is per account and not per household. That’s good. In addition, some custodians purchase more coverage and extend your SIPC insurance into the millions. Again, check with your custodian to be sure. But keep in mind that the coverage replaces money and securities that go missing due to theft or failure. This does not cover market fluctuation. 3. Can your broker steal your money? Yes. Your broker could forge your name (a felony last time I checked) and steal you blind. You’d then have a SIPC claim and your broker would go to the slammer. This happens once in a while but not too often. When it does the brokerage firm usually makes the investor whole rather than waiting for the SIPC to pick up the pieces. That’s not because they are altruistic. It’s because they don’t want the word to get out that they employ thieves and they don’t want you to sue them. Just sayin’. 4. Can the mutual fund manager steal your money? If he or she did, you would probably be covered by SIPC. But it would be hard for a manager (or anyone else) to steal money from your account (unless they forge your name as I said). You see, in most cases, your mutual fund or manager doesn’t even have your money. Here’s what I mean. In most cases, your money is held by a third party trustee. The mutual fund manager tells the third-party administrator what to buy and sell and they execute the trades. This acts as a “Chinese Wall” between your money and your mutual fund. You should read your mutual fund prospectus to find out how it works specifically. Bottom line? Yes. Your mutual funds are safe in some ways and risky in other ways. They will fluctuate in value. There is no getting around that. But don’t worry about losing value due to improprieties. Your time is better spent making sure you have the right investment strategy. That’s what we’re going to cover now. Investors buy funds because they want to invest but aren’t really sure how or don’t want to take the time to research individual stocks or take the risk of having a lot of money in a basket of very few eggs. They buy a fund (with 100’s or 1000’s of stocks in it) and allow the manager to make all the investment decisions. They hope that over a certain amount of time the value of the shares will rise and/or they will collect dividends and/or interest from the securities held within the fund. Let’s dive in a little deeper. Mutual funds hire top fund managers and research departments who are (hopefully) worth the cost (we’ll look at fund fees in a minute). If you were to try to hire one of these managers yourself you’d find it difficult because they typically only work with people with extremely high account values. With mutual funds, you have access to these wunderkinds with as little as $100 to invest. Why fund companies sell funds. As I hinted above, mutual fund companies are in business to make money for themselves – not necessarily for you. They charge fees and sometimes commissions. Some of these costs are disclosed in the prospectus but some are not. I strongly recommend that you read the mutual fund prospectus – especially if you hold your funds for a long time. It’s simply astounding what fund managers can get away with and how much they can charge you. The mutual fund industry likes to keep their vernacular nice and muddy so you don’t question what they do with your money or what they charge you. Let’s unravel that mess right now so you can fully understand what you are looking at before buying a fund. Some funds charge commissions or “loads”. Fortunately, the number of funds that do that is dwindling and it’s very easy to find good funds that don’t do levy a sales charge. But that doesn’t mean fund companies work for free – they don’t. They charge for managing the fund, administration and marketing – and this is just for starters. This may sound complicated but it’s not. All you have to do is review the fund prospectus and you’ll know all you need to know about the fund’s expenses. These are written in plain English and you don’t have to be intimidated by this legal document. But I want to explain something about fees that very few investors know. In reality, “NAV” is your key to understanding fund fees. “NAV” stands for Net Asset Value. NAV is calculated by adding up the market value of all the mutual fund’s holdings at the end of the day. Then, they take that figure and subtract the daily expense the fund charges. The fund takes that result and divides it by the number of shares that are held by investors. The result is the “NAV”. Mutual funds have to calculate and report NAV every day. This is part of the quote you see online or in the paper. Simple example. If a fund has net assets of $1,000,000 and 100,000 shares outstanding, the NAV is $10 per share. Bueno? Now,here’s the part that few people know. Since fund fees are subtracted daily, the NAV and the return you see for the fund is net of all expenses. With that in mind, just know that no matter what the fund charges, it all comes out in the wash because performance is net of those costs. This is not to say that costs aren’t important. Indeed, they could add up to less than .15% or to more than 3% each year. This is going to be more important when we get to the next guide on how to pick the right fund for your portfolio now. You might be shaking your head when I say that, depending on your investment approach, fees don’t always make that much a difference. I get it. All things being equal, the lower the expenses, the better the performance should be. Right? That’s what you are thinking. The problem is that all things are not equal. If you review the highest performing funds from last year for example, you’ll see that the best performer was also the most expensive. (Keep in mind that performance is always presented net of all expenses. That helps you compare apples to apples.) 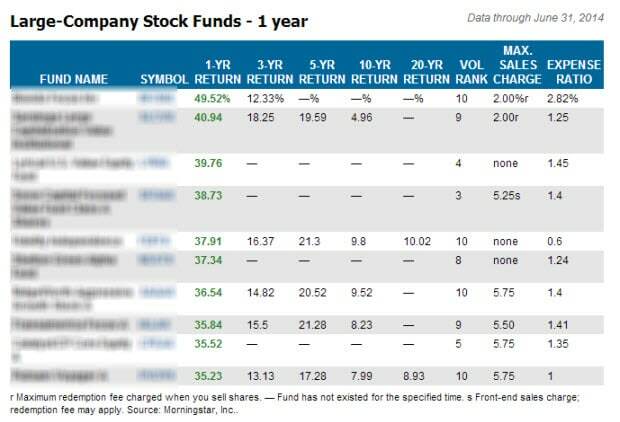 Here’s a list of the top funds from last year. 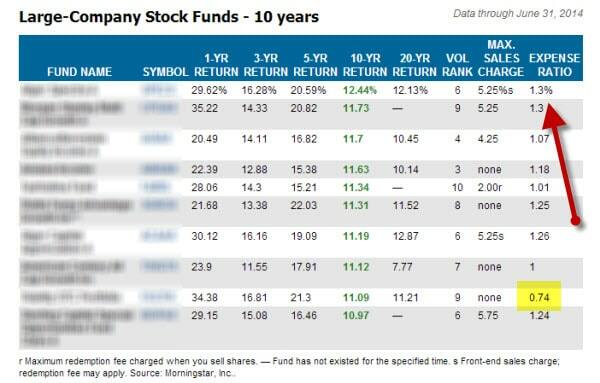 Look at the very last column – it shows the expense ratio of each fund. In fact, there was only one fund in the top ten with annual expenses under 1%. And that fund wasn’t even a super-cheap fund. As you can see, the argument that low expenses translate into out-performance isn’t true. This is true for 1 year and it’s also true for the last 10 years as you can see below. Why is that? Because some managers are really good at what they do and they more than make up for the higher expenses. In other words, fund performance is more important than costs. Why aren’t there any super cheap funds on the list? There are plenty of funds that charge less than .1% per year. Where are they? If the cheapest fund there is charges .07% per year but underperforms the higher cost .49% fund by 2% over this period, is the cheaper fund a good deal? No. Granted, nobody can point to a fund and tell you that it will be one of the best performers over the next ten years. But if we look at the lists of the top performers and rarely see a cheap fund make the cut, it tells you something; right? Oh….and one more thing. Performance is quoted net of all expenses as I said above. Most people don’t realize that. Now you do. And if the goal is making money to achieve your financial goals without taking undue risk, shouldn’t performance be the determining factor? Of course it should be. That said, fund performance, risk and your investment strategy are far more important than fund costs alone. Bottom line? It’s important to understand fees but they should not be your only criteria for selecting how to invest. Having said that, turnover is a term that you may have heard before. This is important as it adds hidden costs to investing. Let’s look at this in more detail. Turnover refers to the number of times a portfolio is bought or sold during a year. Investors look at that number because it helps them understand how frequently the manager is trading. That’s important because higher trading can lead to riskier investment style, higher trading costs and increase your tax liability all at the same time. The fund company calculates turnover by looking at the total dollar value of new share purchases or the total value of sales. They take whichever number is lower and divide it by the Net Asset Value (NAV) of the fund to determine the turnover ratio. Let’s look at an example to see how easy this really is. Let’s say we look at fund XYZ and determine that the value of all its holdings is $100,000,000 as of 12/31/14. We also see that during the year it sold $25,000,000 of its portfolio and replaced those sells with $35,000,000 of new purchases. We take the lower number and divide it by $100 million and determine that the turnover ratio is 25%. All things being equal, the greater the turnover the more it costs the investor. Every time a fund manager buys and sells a stock he or she has to pay a commission of course. But those aren’t the only costs involved. Remember that mutual funds often hold hundreds of thousands of shares of any particular company. When they buy or sell those shares they could be moving a relatively high percentage of all the traded shares. If they flood the market with shares, prices drop. If they snap up a large percentage of available shares quickly, it drives share prices up. This is known as “slippage” and it can be expensive. It’s another cost of turnover. Also, when a fund manager moves in and out of stocks quickly (pushing the turnover ratio up) that can generate short-term gains which are taxed at higher levels than long-term gains. Last, if the turnover ratio is high it indicates the manager is blowing in and out of stocks very quickly. That can mean the fund is speculative and therefore a higher risk proposition. If you invest based on fund performance, turnover doesn’t matter. Yes, the costs are higher but performance is always reported after paying all expenses. And if you purchase funds based on performance that’s really all you should care about as long as the proposed fund is in the risk category you are comfortable with. Need proof? Look at the best performing funds for any particular year. They are rarely those funds with the lowest cost. I’ve noticed that phenomenon for many years. It happens because outperformance can more than makes up for the higher costs of the fund. As you might have guessed, I buy funds based on performance so turnover isn’t critical to me. But if I have two funds with very similar performance I’ll take the fund with the lower turnover every time. Still, I don’t use turnover as a primary criteria. In my opinion, if a fund manager demonstrates real performance, why should I care how much he or she trades? The value of the fund shares rise and fall depending on the net result of what happens to the value of all the securities held within the fund over that period. If the securities rise in value, the value of the mutual fund shares will rise as well. The converse of that is also true. Does it matter which funds I buy? Yes. If you are a “buy and hold” investor (something I discourage) you should probably buy the most inexpensive fund you can find and that often works out to be an ETF. That’s because, over time, very few actively managed funds outperform the index. And since the ETF mirrors the index, over time, an ETF will usually perform better. If you buy funds based on performance and rebalance your accounts with some regularity, it absolutely makes sense to buy your funds based on performance. In that case, you may not have to worry about fund expenses. That’s because performance results are always net of expenses as explained above. Yes it does. If you are a buy and hold investor, the “when to buy” answer is always “when you have the money” without any other consideration. If you are more proactive, your investment strategy must dictate when you invest (and more importantly when you refrain from investing). That means you should only buy funds when the market demonstrates strength. In other words, your investment strategy must dictate when you invest. This is a question I get all the time but it puts the horse before the cart. A much better question is which investment strategy is right for you? First decide about the approach you are going to use. Become comfortable with the pros and cons of your approach and then stick to it. The strategy you use will determine which fund to buy, when to buy it and when to sell it. This is a topic we’ll spend a lot of time with in our next guide. That is the beauty of mutual funds. You can buy in with any amount you like in most cases. Some require an initial investment of $500 but some don’t. In any case, after you make the initial investment, you can add any amount you like. No minimum. If you have very limited capital and even less knowledge, consider using an online broker. They are a great way to start investing and learning at the same time with little cost. If you already invest, you know that there is always risk involved. But are you taking too much risk? If so, you have a greater chance of suffering catastrophic losses and being taken out of the game for good. That spells a retirement working at Flippy Burger. No Bueno. Funds that buy stocks from only one country are called country funds. At times, a country’s stock market does really well. When that happens, the corresponding country fund takes off. There may be strong fundamental reasons for the local market doing well or it may be a result of speculation (or a combination of both). Regardless, you should stay clear. Any country’s bubble can burst quickly as a result of economic, political or military instability. 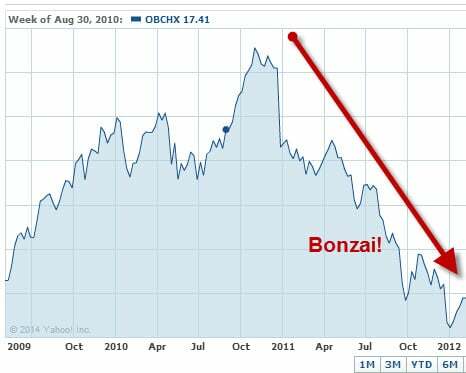 This Russian country fund lost 25% in 5 months in 2014. The Chinese country fund lost over 50% within a year. Their respective losses had different causes but they both demonstrate how volatile these kinds of funds can be. Believe it or not, a country fund can be more risky than an individual stock and I don’t even like those for most people. Some funds buy raw material contracts for sugar, gold, coffee, copper etc. These are known as commodities funds. Some of these only buy contracts on one commodity and others buy contracts on a variety of commodities. People buy these funds when they think the underlying commodity is in short supply relative to demand. If the investors are right, the fund value will rise as the price of the underlying commodity goes up. I advise you to stay away from these investments too. Even if you think you know the price of the commodity is going up the truth is you don’t really know. Of course you could make money on this play but it is pure speculation. Think about gold if you want a painful reminder. Investors were bombarded for years with hype about how they could make a killing in gold. And many people did – until they didn’t. Gold dropped from around $1800 an ounce to less than $1300 in a very short time. Can you imagine what happened to the gold commodity funds? It was not pretty. Industry funds can be slightly more diversified than commodity or country funds but not much. These are funds that only invest in companies belonging to a given industry. Examples include computer software, transportation, energy exploration etc. They suffer from the same problem the other two do– narrowly focused investments. The risks are too great – non merci! If you hear about a fund that’s done really great make sure it’s established and well-funded. Sometimes it’s easier for new funds and ETFs to put up impressive numbers because they don’t have much money to invest and/or they don’t have a long track record to make up for. Newbie funds often focus their assets in a small number of securities. If they get it right, the returns can be impressive. But what you want are funds with long-term track records. Look at the fund performance in good and bad years. That is a much better measure of what you are getting yourself involved in. A target fund is a managed mutual fund that is supposed to tapper risk as you age. They are sometimes known as lifestyle funds. They do this by gradually shifting the allocation of securities each year away from equities and moving that money over to bonds instead. By the time the fund owners retire, the target fund might have 60% or more of the assets invested in bonds. So why are target funds just wrong for most people? Target funds transition money from equity over to bonds as the years go by as I said. This is done ostensibly to reduce risk. The argument is that your portfolio should be very conservative on the day you stop working. That’s why they heavily favor bonds over time. But that thinking is simplistic and dangerous. Here’s why. In fact, if you plunk all your retirement assets into bonds you might increase the risk of going through all your money before you die. Bonds are a great hedge against stock market volatility. But they aren’t a good hedge against inflation. And if you think about the next 30 years of your life and don’t make allowances for inflation you’re looking for trouble. And what happens when rates are low and rising? That’s usually not a great time to put your money into bonds but target date funds do anyway. But why pile money into long term bonds with interest rates so low? I can’t see the sense of it…can you? Probably not. But target funds don’t consider current market conditions they just plow your money into bonds based on the calendar and ignore the market. In my opinion, that’s a “no bueno grande”! From all this talk about how target funds focus on safety, you might be surprised to learn how risky they can be. In fact many expose investors to far more risk than they imagine. In 2008, the average 2010 target date fund cratered 23% according to Morningstar. Keep in mind that if you owned a 2010 target date fund in 2008, you expected to retire in 2 years. If you bought a target fund you expected the fund manager to be true to her word and hold very conservative securities. Sadly, most target fund managers didn’t deliver. Why not? Marketing. Remember, target funds compete with each other for investors’ dollars. They want to put up high return numbers to catch your attention and business – even though they market themselves as an answer to stock market risk. As a result, some managers stuff the fund full of very aggressive investments and the unsuspecting investor picks up the tab. You might think that all target funds are alike but that’s not true. Each fund has its own manager and a unique prospectus that governs how the fund invests. That means different target funds with the same maturity date often have vastly different holdings. In fact, on the day you retire, some funds might have as much as 70% in equity and others might have as little as 20%. The only real way to know what you are getting involved in is to read the fund prospectus. Target date funds don’t work for retirement investing as I’ve demonstrated. But they might be smart if you have a college savings 529 plan. That’s because 529 plans are designed to be depleted over a short time – 4 or 5 years – once your student starts school. As a result it is smart to have the money very liquid and very safe once he or she hits age 18. But again, retirement assets are very different. Once you start tapping into your retirement money you want to withdraw that scratch over a very long period of time. As a result, you need more control over the equity component of your retirement assets. Target funds don’t work because they often shift your money into bonds way too fast and can expose you to investments that are far riskier than you would otherwise feel comfortable with. Green mutual funds are no longer a fad. The idea of investing in companies and technologies that make our world a better, cleaner place has merit. But if you want to find the top green mutual funds, be clear on two things before you start your search: your motive and priorities. Are you primarily concerned about making money? And is “green investing” a secondary consideration? If so, you’ll be able to cast a wider net. Simply compare mutual funds, find the best ones and then weed out those investing in the wrong companies or industries. You can do that by looking at your fund’s prospectus or going to the fund’s website. You’ll easily find the top holdings – or all the holdings a fund has. But let’s say making money isn’t your main goal. Let’s say you want to support certain industries like solar or wind energy. If this is the case, you’re probably going to be best served by finding an ETF that is focused in these industries. Better yet, invest directly in the companies you want to support. Now, if your main motive is political rather than financial, don’t get confused down the line. Forget about short-term performance. My experience tells me it’s impossible to make smart investments when you have more than one main objective. This is not to say that you can’t make money investing in green mutual funds or individual companies. I am sure you can. But if you expect to go green and also own top performing funds, you’re going to face long periods of disappointment. There will be periods when green mutual funds do well. But it’s such a narrow niche that over many years, your fund won’t often be among the top performers. Another word of caution: not all funds that claim to be green actually are. Actively managed funds are managed with great discretion. As a result, while many hold themselves out to be green, some may not be. In fact one major green fund advertised as green and socially responsible, but the top ten holdings include IBM, General Mills and 3M. This is closer to a large cap fund than a green fund. As I said before, if you compare ETFs versus mutual funds, green ETFs are probably a better bet because they are more transparent and leave less discretion to the fund manager. Now, if you are a fan of capitalism, you might not want to target green funds for investment but simply invest in top performing funds. If the green mutual funds do well, they’ll rise to the top and get on your buy list that way. To be frank, that’s my approach. If you want to grow your money for the long-term you should probably avoid buying funds solely based on their 10 or 20 year track record. That’s because it’s highly unlikely that they will turn in a winning track record over the next 10 or 20 years. There are several reasons for this. First of all, many mutual funds go kaput. According to the Investment Company Institute, 50% of the funds that existed 20 years ago no longer do. They’ve either closed their doors or merged with other funds. There is a 50-50 chance that the fund you have your eye on now won’t even exist 20 years from now. The next problem is that over the next 20 years any fund you buy is going to go through some very rough patches ahead. No Load FundX did a study last year that reviewed the year-by-year performance of the funds that turned in the best numbers from 1990 through 2012. One fund had an eye-popping 13.6% annualized return and was one of the highest performers during that period. But in 1998 and 1999 it lost money while the market was up over 20%. The fund that did so phenomenally well over the 23 year period, underperformed the market by a devastating 35% in 1998 and 33% in 1999 according to the study. 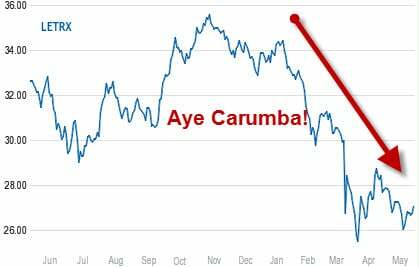 How long would you hold on to a fund that underperformed so miserably over a year or two? You’d probably bail out during the first year….am I right? This underperformance phenomenon was widespread. Every single fund in the study had a stretch of 1, 3 or 5 long years where the returns were far weaker than the market. That means along the way a lot of investors were shaken out of their positions at the worst possible time. And keep in mind that funds do really well under a certain set of conditions like the economy, market and fund manager at the time. But those conditions change. When they do the performance may disappear as well. In short, long term track records for mutual funds are for the birds. They don’t give you a good basis upon which to make good investment decisions. The problem with multi-year averages is that average performance can hide some extremely good and bad years. In other words, a particular fund might have a good average return but behind that average could be a high risk fund you need to avoid. And if you only consider the average performance, you’ll miss that. If you calculate the five year average you’ll find that it is 2.6%. That sounds like a sleepy fund. But is it? If you look at the annual returns (year-by-year) you get a much clearer picture; this fund has been OK over several years but it had one very bad year. Your next step would be to compare the year-by-year returns with the appropriate benchmark like the S&P 500. That will tell you how this fund performed against the market each year. (Don’t worry, I’ll show you how to do that.) Can you see why this is far more important than the long-term averages? Long-term averages don’t give you much useful information. In 2001, many technology funds were rated 5 star funds. Those stars were awarded based on 3 and 5 year performance. And to be fair, these funds had outstanding returns in those prior years. But in 2000 and 2001 they were dying. And if you bought those funds based on star ratings or long-term average returns alone, you suffered tremendous losses in the following few years as you can see from the chart above. By 2001, technology funds were already in a nose-dive as I said. That free-fall continued until March of 2003. All you had to do to see that was to look at the recent performance. Obviously, people who ignored that year-by-year performance did so to their own detriment. And if you invest based on stars and long-term averages, you could easily run into a similar problem. Many people look at star ratings and/or average performance over a long period of time but that is dangerous in my experience. Stars are usually awarded based on average performance over several years and averages are worthless and actually can be dangerous. That’s because they mask unusually good or bad years. In other words, one really good or bad year can really skew the averages. If you calculate the three year average you’ll find that it is 14.3%. But what does that 3 year average tell you about the fund? Nothing. Now that you understand how funds work and they myth behind long-term performance, lets consider a better way to find the right funds for you. Granted, there is no formula that can predict which funds will perform best over the next year or longer. In order to do that you’d need a crystal ball. But remember, we’re interested to find the right funds for you. And the answer to that question depends on your situation. Let’s go through this exercise together so you’ll see how easy it is to find the right mutual funds for your investment universe. Ask yourself the following questions to help narrow down the field. Is it income you are most interested in? What is your investing time-frame? How much risk are you willing to take in any given year? Are you going to monitor and adjust your fund choices? How often? These are all questions you have to answer before even leaving the gate. My experience is that many people don’t do this. As a result, they just pile into the hottest fund they can find and often become disillusioned when the market turns tail. 2. Where did you open your account? It shouldn’t be this way but often the mutual funds which are made available to you depend on where you open your account. That’s why if you are a DIY investor, I always recommend using an inexpensive broker that offers the most fund choices possible. And I usually suggest that you stay away from opening an account directly with a mutual fund company. For example, if you open an account at Vanguard, you may only be able to buy Vanguard funds. Don’t get me wrong, Vanguard has some fantastic funds. But other companies offer great alternatives as well. Why restrict yourself to only one family of funds? To me it doesn’t make sense. I think a better idea is to open your account with an inexpensive broker instead. Now that you’ve identified what you want to achieve and you’ve set up your account, it’s time to create a universe of funds that potentially fit the bill. There are two free online tools that might help you do this. One is over at the Wall Street Journal’s site and the other is provided by Morningstar. Let’s look at the WSJ’s screener to get a better idea of how you might create your own fund universe. Keep in mind that you are only trying to create a pool of funds to select from at this point. You aren’t trying to screen down to your final choices – we’ll get to that later. My suggestion is to whittle your list down to 25 to 30 funds and no fewer. The top arrow on the right is the section where you screen for equity, fixed income or tax-free fixed income. To the right is “Lipper Category” highlighted in yellow by yours truly. 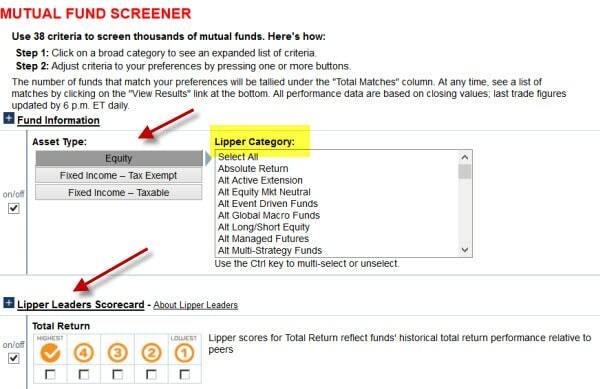 You can screen very narrowly under Lipper Category but for most people I suggest you scroll down and select the S&P 500 filter. If you do this, you’ll screen for funds that did well relative to the broad S&P index – Bueno. Want an easy way to outsource fund selection? Talk to Neal. Next look at the Lipper Leaders (the second red arrow on the bottom left). Keep in mind that you want a decent size universe of funds to choose from as I said. With that in mind, you might want to accept the best 2 or 3 levels rather than just the top level funds. Keep in mind that these Lipper ratings are relative and awarded at just one point in time. If you take the top few levels, you have a better chance of having great funds in your pool even if they aren’t doing the very best at this exact moment in time. From here on you can continue to narrow down your universe of funds using the technical filters provided by the site. Personally, I don’t find these additional screens that useful but obviously you are free to use them. Once you’ve created your fund universe it’s time to pick the funds that best suit your particular requirements for growth potential and risk reduction. The best way to do that in my experience is to look at the year-by-year returns on your funds compared to the market indexes. Note – it’s very important to look at the year-by-year returns rather than use 3, 5 and 10 year average. This step is really important. When you look back over the last 10 years and see how your fund performed in each year compared to the market, you get a sense of how well your fund did in good years and how poorly the fund did when things were rocky. This in turn helps you understand what kind of ride you sign on for when you buy any particular fund – and how much risk you could be exposed to. Finding the right mutual funds to fill your roster isn’t that difficult. The process I detailed above will help you do just that. Of course there is no guarantee that any particular fund picking method will result in outsized gains or shield you from losses. But a process such as this is a good way to do your homework and find funds that make sense for you. Go to Yahoo! and do a search for the name of the fund. A number of items will come up but you’ll see under “Also Try” that the symbol will pop up. At this point, you could just go to the fund’s site and dig around for the information you want, but let me show you a few shortcuts. 6.To compare performance, look towards the top of the chart. You’ll see a COMPARE button. Select it. 7. You’ll see a drop-down menu. In this case, I’m going to select “S&P 500” and then “DRAW.” This gives me a chart showing how the Janus fund did compared to the S&P 500. In this case, we can see that the Janus fund did better than the S&P 500 for the time period selected. If you want to compare the fund to a period during which the market did poorly, simply change the dates. It’s important to look at these different time periods if you want to make smart decisions and eventually have more retirement income. What percentage of the fund is invested in stocks, bonds and/or cash? All things being equal, the more the fund is weighted towards stocks, the more volatility you can expect. Having said this, it’s important to understand that different stocks and different bonds have different risk profiles. Some funds hold very aggressive stocks (like micro-cap and emerging country stocks) and other funds hold more conservative equities. The same goes for bonds. You might be surprised to hear this but some bond funds are riskier than some stock funds. You have to look under the hood friend. The fewer bonds or stocks the fund holds the greater the risk. Likewise, a fund with more positions means any one particular holding has less impact on the overall performance. While we’re on the topic of diversification, look at how clustered the stocks are around any one industry or sector. I strongly recommend against investing in sector or industry funds. Those funds are far more volatile than diversified funds. Stocks in one industry often rise and fall together. If you buy a fund that invests all the money in one industry or sector it defeats the purpose of buying a fund in the first place. Comprende? If you are drawn to a particular fund because of its long-term year-by-year performance, make sure the person responsible for that performance is still at the helm. Find out if the current manager was the same person who managed the fund during those stellar years. If not, the performance may not be meaningful. Your investment strategy should lead you to make your investment decisions. In other words, your process should answer the question,”which fund should I buy” and having a good process is far more important than having a particularly good fund at any point in time. That’s because your process has a (somewhat) repeatable result while the impact of picking out a good fund by luck is not. Here is a list of investment strategies that I use. This can give you an idea of the different ways to approach investing. Once you are clear on your process, stick to it. Fund fees are more important to those who buy and hold than those who select funds based on performance. Last, don’t lose sight of your main objective or the main reason you invest in the first place which is probably to achieve your life goals without worrying about it. Keep that uppermost in your mind and make sure your decisions are closely attuned to that. Short-term performance may feel good (or bad) but it just isn’t that important and if you focus on the short-term it may cost you a great deal over the long-term. What you should know now. This guide has explained how funds work, which funds to avoid and how to find the funds that fit your needs. It takes a little work but it’s not impossible. Again, if you want to discuss outsourcing this process, you can send me an email. I’d be delighted to discuss this further with you. Otherwise, your next step is to determine when to buy and sell the funds that are in your fund universe. That’s what we’ll discuss in our next guide.